Two worthy successors to the legendary GTX 750 Ti. After months of focusing on the high end, Nvidia’s GeForce GTX 10-series is finally trickling down to the masses. The $109 GeForce GTX 1050 and its bigger brother, the $139 GeForce GTX 1050 Ti, are a pair of affordable new graphics cards designed to ease introductions into PC gaming. At those prices, it’s clear that Nvidia’s aiming directly at the Radeon RX 460’s jugular—prompting AMD to launch preemptive price cuts. But the GTX 1050 and GTX 1050 Ti are more than fresh foot soldiers in the never-ending war between AMD and Nvidia. While the older GTX 950 required the use of an extra six-pin power connector for most of its life, the GTX 1050 and GTX 1050 Ti assume the mantle of the popular GTX 750 Ti by sipping a mere 75 watts of power, allowing them to draw all needed energy via your motherboard alone. That means you can slap Nvidia’s new cards into a prebuilt “big box” PC from the likes of HP and Dell to transform them into full-fledged gaming machines with minimal hassle—a trick that 2GB variants of the Radeon RX 460 can also perform. Can Nvidia’s GeForce GTX 1050 and GTX 1050 Ti dethrone their Radeon rival, much less live up to the GTX 750 Ti’s immense legacy? Let’s dig in. To add to the intrigue, the GTX 1050 family isn’t built on the same underlying technology as the rest of Nvidia’s GTX 10-series. Taiwan Semiconductor Manufacturing Company (TSMC) fabricates the GTX 1080, GTX 1070, and GTX 1060 using the 16nm manufacturing process and Nvidia’s “Pascal” GPU architecture, but the GTX 1050’s brand-new “GP107” graphics processor is built using the 14nm process at an undisclosed manufacturer (likely Samsung). The benchmarks will reveal whether that makes a difference in performance. 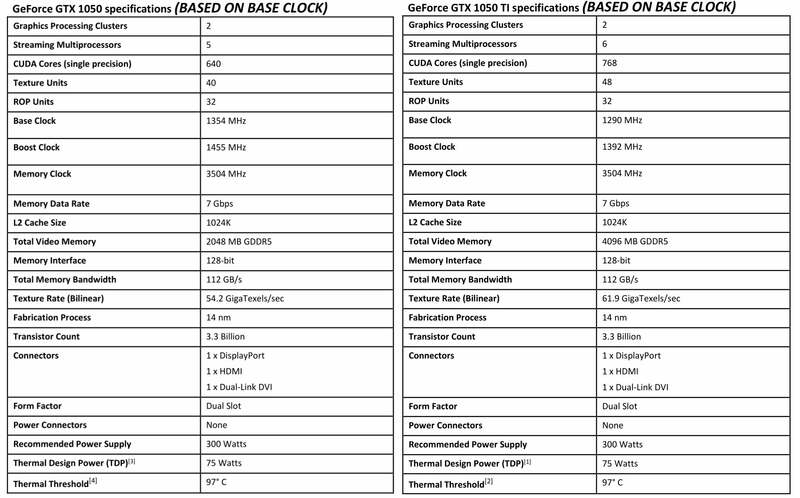 At first blush, the GTX 1050 and GTX 1050 Ti hit far lower overall clock speeds than the rest of the GTX 10-series, all of which boast at least 1,500MHz base clocks and boost clocks hovering around 1,700MHz or higher. By contrast, neither GTX 1050 card achieves 1,500MHz even when boosting, though Nvidia says it was able to “hit speeds in excess of 1,900MHz with ease” when overclocking the cards internally. Check out the $110 GTX 1050 and $140 GTX 1050 Ti’s full specs below. AMD’s $110 Radeon RX 460 and $140 RX 460 differ only in memory capacity—at their heart, the “Polaris” GPU in both versions are the same. Nvidia also uses 2GB (GTX 1050) and 4GB (GTX 1050 Ti) memory capacities to differentiate between its two cards, but each offers different performance levels as well. The pricier GTX 1050 Ti packs the full-fat version of the GP107 GPU, with 768 CUDA cores and 48 texture units across its six Pascal streaming multiprocessors. The cheaper GTX 1050 features a higher clock speed, but shaves off a streaming multiprocessor, resulting in 640 CUDA cores and 40 texture units—exactly half the internal hardware of the $250 GTX 1060. 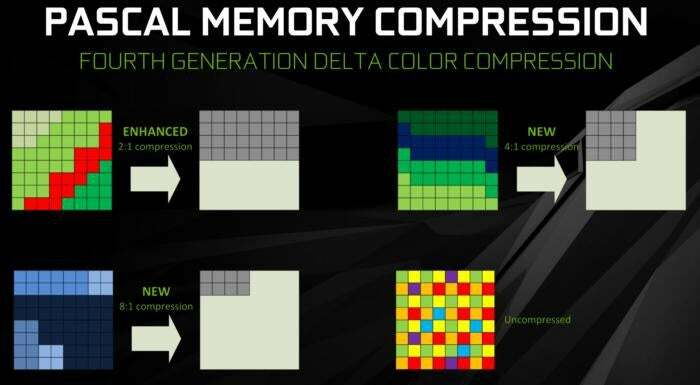 Both cards offer 7Gbps memory speeds over a 128-bit bus, buoyed by Nvidia’s superb bandwidth-saving delta color memory compression. But more importantly, both cards draw under 75W of power, allowing them to slip seamlessly into many prebuilt boxed PCs. 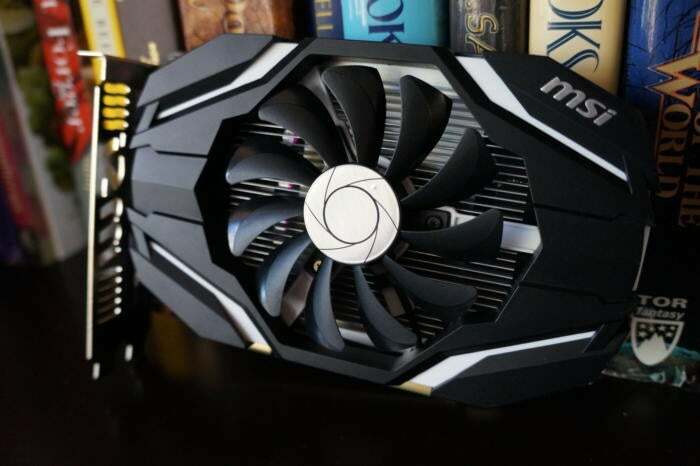 The 2GB Radeon RX 460 can too, of course, though the majority released at launch bolstered performance by requiring an additional six-pin power connect, negating that upgradability advantage. 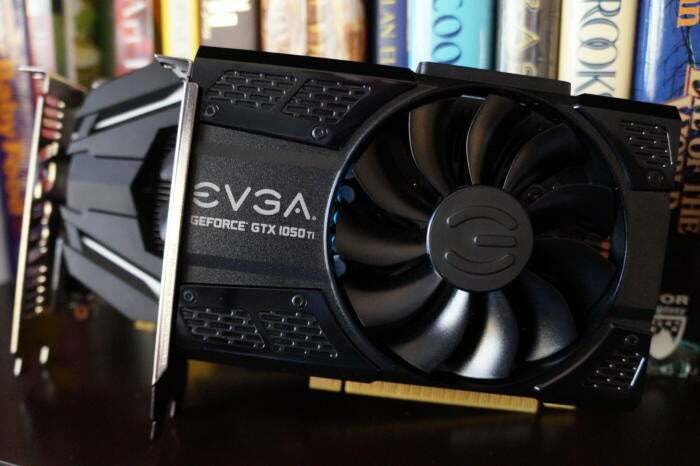 Card makers will be able to add six-pin power connectors to customized GTX 1050 and 1050 Ti variants, as well, but both of the cards tested today draw their full power from a motherboard. Adding a discrete GPU to a prebuilt PC provides a massive boost in gaming performance, as illustrated in the Nvidia-supplied graphic below. 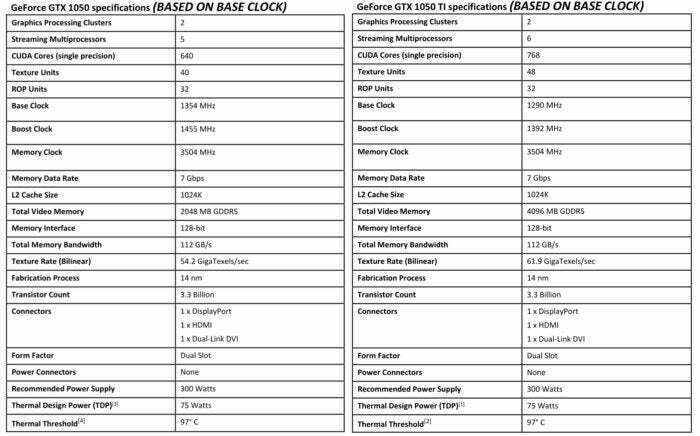 The GTX 1050 and GTX 1050 Ti offer all the same features as Nvidia’s other “Pascal”-based GTX 10-series cards, including goodies such as HDR support, Ansel super screenshots, Fast Sync, simultaneous multi-projection, performance-boosting multi-resolution shading, and more (again, all of which we covered in detail in PCWorld’s GeForce GTX 1080 review). 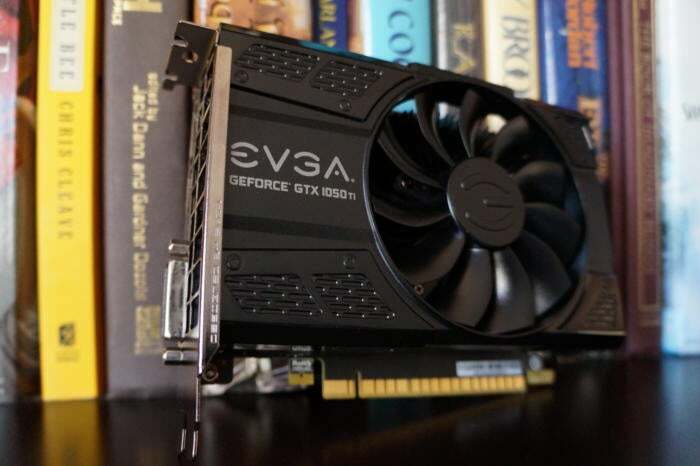 The default port configuration consists of one DisplayPort 1.4, one HDMI 2.0, and one DVI-D connector, but as with the GTX 1060, the GTX 1050 family doesn’t support multi-GPU SLI configurations. 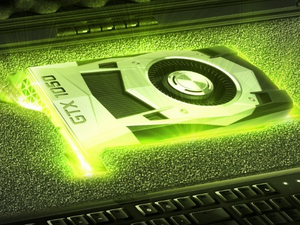 Nvidia isn’t releasing a Founders Edition version of the GTX 1050 or GTX 1050 Ti, and a wide variety of custom boards from a wide variety of graphics card makers will be available when the lineup launches Tuesday. 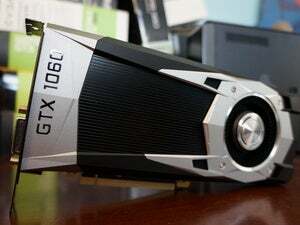 We tested two no-frills, single-fan graphics cards. The $110 MSI GTX 1050 OC. The MSI GTX 1050 OC with 2GB of RAM adds a roughly 50MHz overclock (to 1,404MHz base/1,518MHz boost) without any extra cost. It will be priced at $110 when it launches at some point before November 8. The $140 EVGA GTX 1050 Ti SC Gaming. 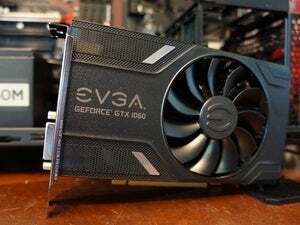 The EVGA GTX 1050 Ti SC Gaming ($150 on Newegg) with 4GB of memory ups things a bit further over the stock GTX 1050 Ti, to 1,354MHz base/1,468MHz boost, with the help of EVGA’s ACX 2.0 cooling technology. Nvidia says the GTX 1050 lineup is capable of playing modern games at 60-plus frames per second at 1080p resolution, at either Medium or High graphics settings. Is it true? Onto the fun stuff! MSI's overclocked GeForce GTX 1050 graphics card outpunches its AMD rival for significantly lower cost, and can seamlessly slip into prebuilt "big box" computers. It's a great budget gaming option. The EVGA GTX 1050 Ti SC Gaming can effortlessly upgrade a prebuilt PC into a gaming rig capable of outplaying modern consoles. It's cool and power-efficient, too.